April 24, 2017, 9 a.m.
By Ricardo Bilton @rbilton April 24, 2017, 9 a.m.
David Fahrenthold never did find much evidence of Donald Trump’s charitable efforts, but he got a Pulitzer Prize for his trouble. Fahrenthold’s reporting, which he tracked via pen and paper and which relied on input from readers, “created a model for transparent journalism in political campaign coverage while casting doubt on Donald Trump’s assertions of generosity toward charities,” according to the Pulitzer Prize board. Hearken is modeling the idea on the efforts of organizations like ProPublica and The New York Times, which recently have made efforts to both publicly verify breaking news stories in real-time and involve readers in the reporting process. With Open Notebook, Hearken hopes increased audience engagement will help reverse the declining trust in mainstream media among Americans. A 2016 Gallup poll found that Americans’ trust in news organizations “to report the news fully, accurately and fairly” dropped to an all-time low: Just 32 percent of Americans said that they have a “a great deal” or “a fair amount” of trust in the media — an eight percent decline from the year before. Pew found similar numbers in its own polling last year. Just 18 percent of American said they trust the news they get from national organizations “a lot,” and 22 percent said the same for local organizations. Beyond engagement, Hearken’s pitch is built around the idea that, by building an engaged audience that has an active hand in producing the reporting it’s interested in, news organizations can turn more of that audience into paying customers. “People won’t give you money unless you’re serving them, and this is a way to make sure you’re actually doing so,” Haslanger said. Public media organizations, which make up a significant portion of Hearken’s user base, have been particularly enthusiastic with their embrace of the approach, said Haslanger. The approach does have some hitches. The work of journalism has traditionally operated behind closed doors, with stories carefully assembled and fact-checked before being offered to the public. This is true particularly for sensitive in-depth investigations, but it extends to lighter stories as well, even in the digital era. Evancie, for example, said that Vermont Public Radio wasn’t immediately sure which kinds of stories would work best with the Open Notebook approach. That’s why the organization felt that Brave Little State, which was “already aligned with with the transparency idea,” was a natural fit. She said she was less sure about the process would work with stories that had more sensitive sourcing. Haslanger said that this has has been a common concern among the early users of Open Notebook, and her response has been unequivocal. “If you’re doing a very secretive investigation that relies on no one else knowing, this is not the tool for you,” she said. Photo of reporter’s notebook by Roger H. Goun used under a Creative Commons license. POSTED April 24, 2017, 9 a.m.
Bilton, Ricardo. "With Open Notebook, Hearken wants to help news orgs do more of their reporting in public." Nieman Journalism Lab. Nieman Foundation for Journalism at Harvard, 24 Apr. 2017. Web. 23 Apr. 2019. Bilton, Ricardo. 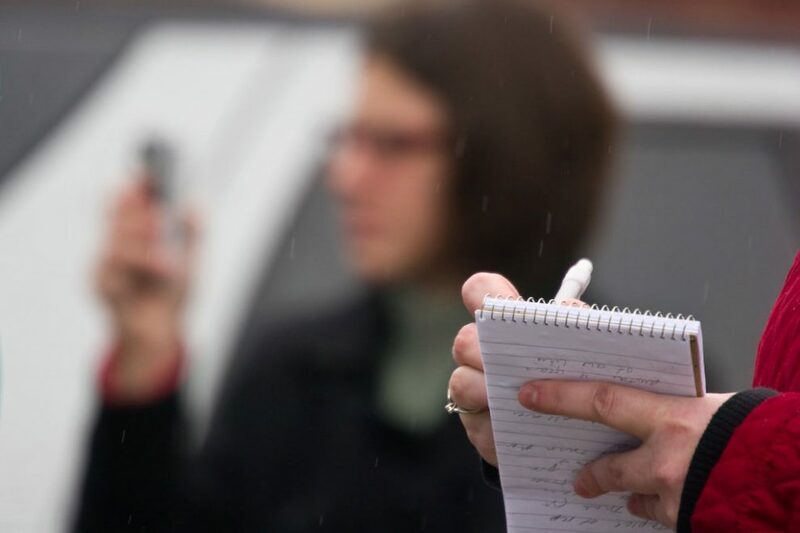 "With Open Notebook, Hearken wants to help news orgs do more of their reporting in public." Nieman Journalism Lab. Last modified April 24, 2017. Accessed April 23, 2019. https://www.niemanlab.org/2017/04/with-open-notebook-hearken-wants-to-help-news-orgs-do-more-of-their-reporting-in-public/.